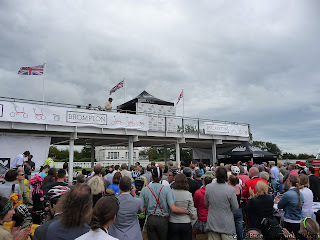 But this year was in a new unproven location, Goodwood Motor Racing Circuit, Chichester. We arrived in plenty of time at Goodwood and was guided to the parking space pretty close to the circuit, Perfect. As I unloaded Bumble B I suddenly thought to myself, we are actually here and will creating awesome memories for anyone lucky enough to set their eyes on a legend. Began my way though another carpark and spotted a few fellow LBC members gathering and chatting away. 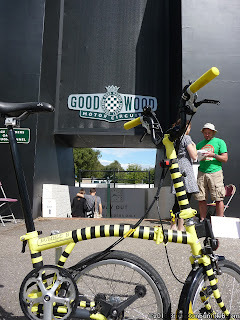 Me and Bumble B decided to make our way to get all registered and pick up a few ordered bits namely the Brompton World Championship Mug & T Shirt I had ordered on Bromptons website. As always getting great comments from everyone saying they loved my whole outfit. Never get tired of hearing how it makes people smile. Wondering though the Orbital Grounds seeing what was around, I found myself at the Brompton stand ordering myself a cycling jersey. I asked for a XL but I've just tried it on tonight and its a little tight on me, I thought XL would be big enough but these cycling jerseys are extremely close fitting. I'll have to see about getting an XXL when I can. Walked around the event grounds stopping quiet often as everyone wanted to get a few photos of me and Bumble B.Was very glad to meet one of the guys from NYCeWheels (Peter Yuskaukas) as I always like that they do tours on yellow Bromptons al over New York City, USA. 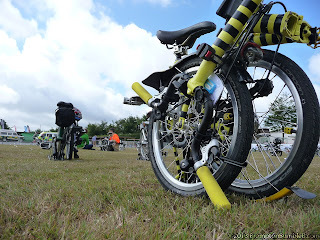 I even had an idea of next year maybe popping over with Bumble B to go on one of their rides. Finally the it was time for everyone to get to the starting grid. 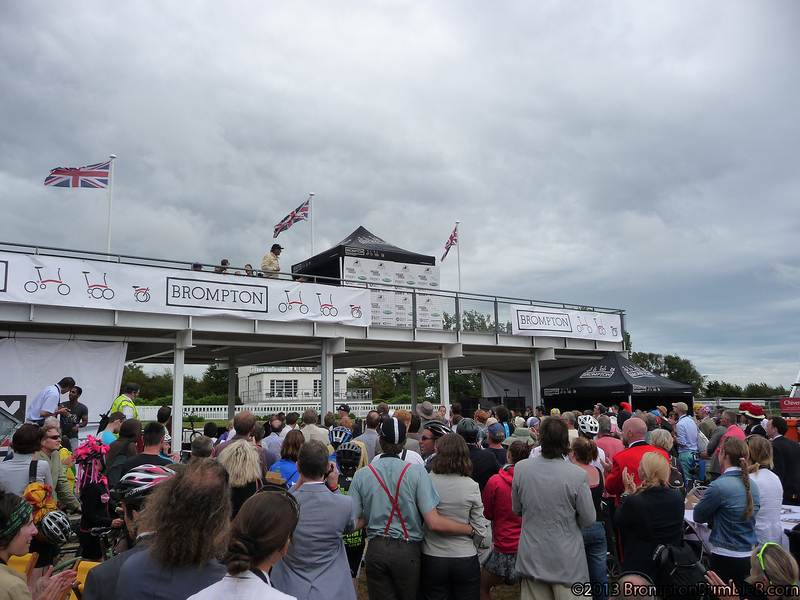 Classic Brompton start as always is FULLY folded Bromptons on the start grid with riders a distance away. I set Bumble B down, I think he was a little nervous, he wasn't the only one. I calmed him down with some comforting words. While we was getting ready of the start someone grabbed my hand, shaking it with force. I was taken aback for a moment. I looked up and it took a few seconds for it to sink in. 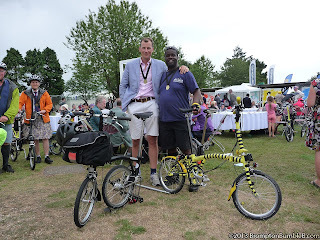 The man shaking my hand was none other than Will Butler-Adams (MD of Brompton Bicycles). A big smile broke out on my face as I've been wanting to meet him for quiet awhile but never had the chance. I got a feeling he has known of me & Bumble B for quiet awhile. Didn't get to say much but made mental note to try and catch up with him after the race and get a photo of us together. But now it was time to race. Brought my breathing under control. Everything I had done over the year had been focused on the next 30 mins. All the training I had done on my Cadence, foot position, breathing, slipstreaming. When the horn sounded my heart was in my mouth but calmly walked to Bumble B, unfolded him and walked him to the tarmac. Once we hit the track the crowd volume definitely went up, they knew they where in the presence of a legend. 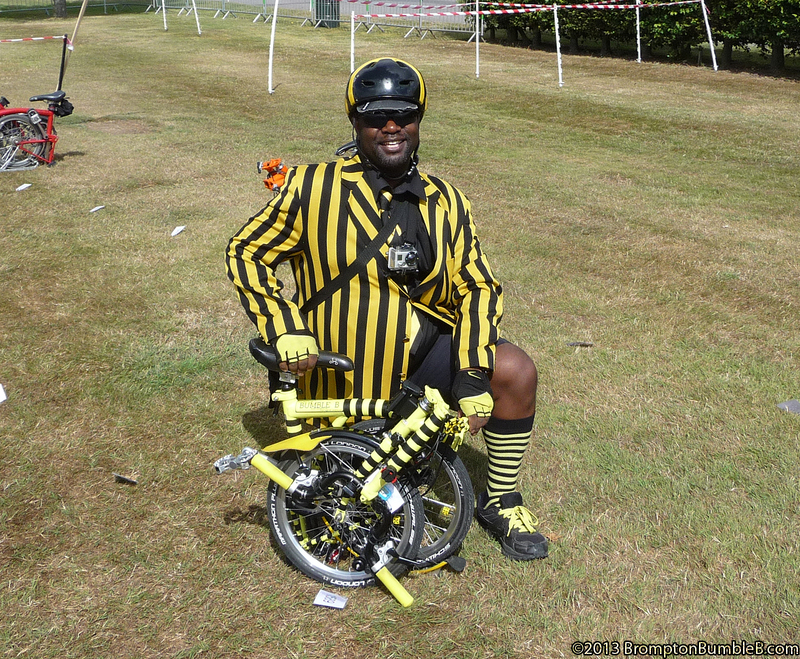 I could hear the announcer calling out here he comes, Bumble B in black and yellow. I couldn't help but smile and I think I may have waved and cheered the crowd and myself on. On the track was pretty good but it was HUGE and with it being so open and a little windy well I definitely felt it. Got into a nice pace I thought and tried to keep up with whoever I could find. I did do alot of slip streaming to help conserve some energy. I don't remember much of the laps but I do remember making sure I put in a good finish. 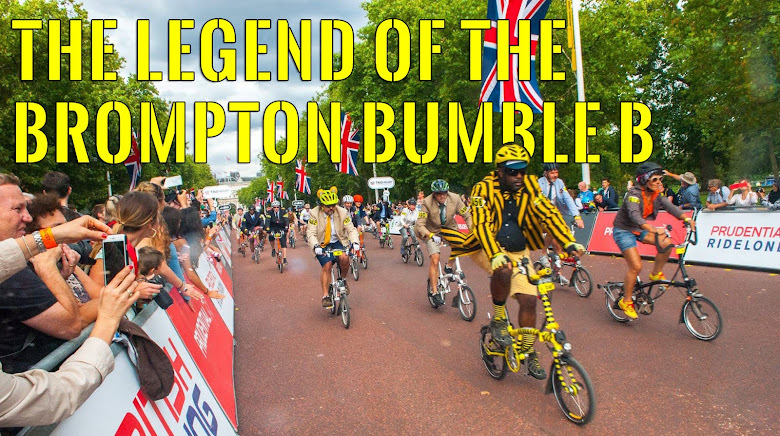 I do remeber many of the faster riders when passing me shouting out words of incouragement, remembered my cycling partner in crime Mr. OrangeBrompton dinging his bell too. On the final corner I was slip streaming another rider and I made my move. I put the power on and pedalled like a mad man. There was another rider up ahead of me that was pretty close to the finish line, I made it my mission to pip that rider to the finish line. I pushed HARDER than I ever have, pushed everything. 5 yards I pushed and LUNGED at the line. 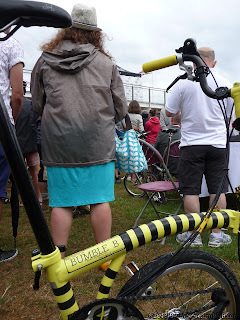 It was a photo finish but I think I just about got Bumble B's front wheel ahead of the rider I was chasing down. My own personal Tour de France finish and it felt WONDERFUL especially with the crowd cheering like crazy. 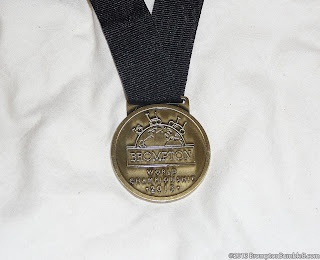 It felt like I was at the Olympic games winning the gold medal. 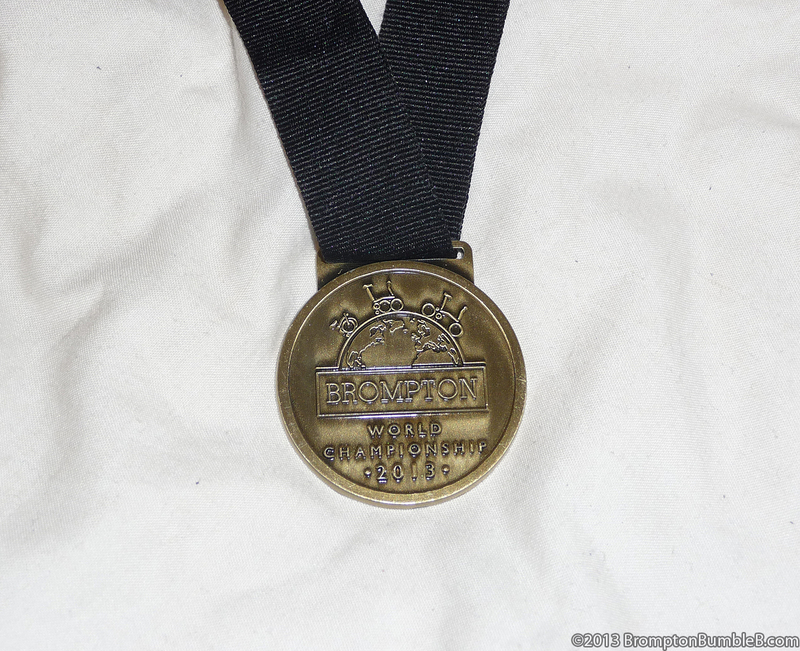 I'd done it, I powered down and glided to the finishing enclosure and was greeted with big smiles from folks handing out the medals. Waiting for us was a well needed drink, which I sucked down like it was the last drop of fluid on the planet. So this is what winning tasted like and it tasted good & fruity. 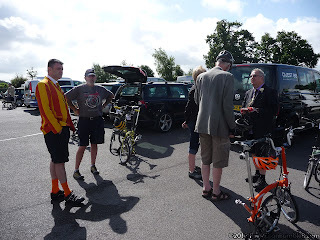 After we had rested we walked around finding a few folks I knew and ofcourse chatting about our Bromptons and what the next event was going to be. 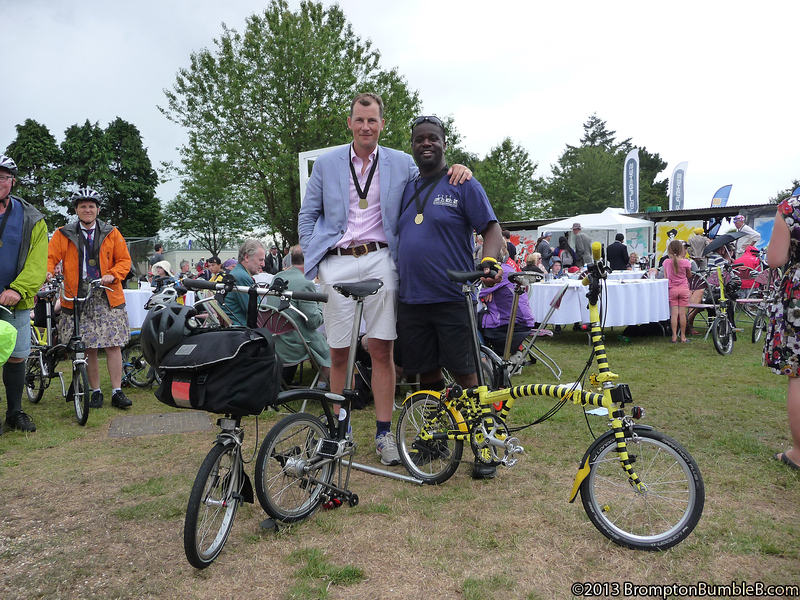 I found myself at the Brompton tent and I saw Will Butler-Adams (MD of Brompton Bicycles) I saw my chance to have a quick word with him. First thing he said to me was did I like the presents on Bumble B. My god he knew of the Legend, I was honoured. I told him how wicked pleased I was when I got Bumble B back after getting a warranty claim cause of a small crack I found and they the "extras & upgrades" they put on him. Told him how I pretty much cried in the shop when I picked him up. He seemed very pleased by this. I stayed for the presentations of the prizes which was great atmosphere. At the end of if all Will Butler-Adams made a great little speech and even gave me a honourable mention, which had me cheering. 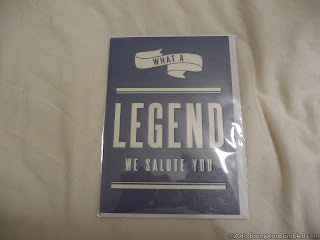 Just before I left Mick B gave me a little present, something he saw and thought of me instantly. Well it was time for me to leave the awesome Goodwood Motor Circuit. Great place for the BWC and a nice change. I would however like to return to Blenheim as I did like the scenery there and would like to go around taking photos with my IR camera especially. 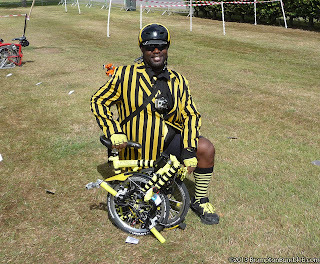 I did hear there is a Family Cycling day on the 18th August which looks to be on the same day as the next iBikeLDN Summer Ride. Next big event is the Prudential Ride London: Freecycle next weekend which should be a good with all the roads in central london closed down just for cyclist. My Garmin Edge 800 Race Data I started recording my data too early so it didn't count the laps properly but other than that the data is pretty good. I did however forget to wear my heart monitor, abit rushed getting in and then too excited to remember put it on. 28th July, 2013. 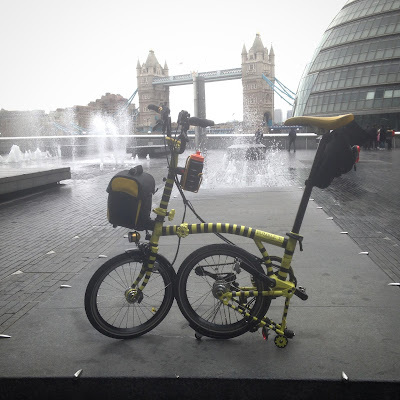 The day that the Legend reached the Brompton Boardroom. Great posting, as always.Good to see you yesterday. Well done, and an excellent write-up as well! 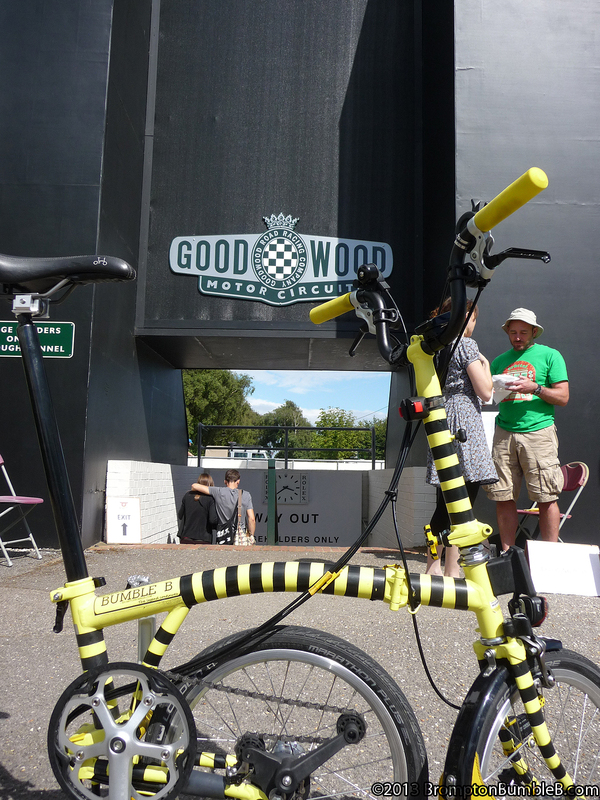 Particularly like the shot of you and Bumble B pre-race (where on earth did you get those perfect stockings? ).